This three section manually operated van ramp is the solution for those people needing a reliable affordable ramp. This ramp is designed to be mounted to the floor of a van and has high traction tape on the surface for added safety. No assembly is required and it is easily installed. The ramp is constructed of aluminum and is spring assisted making the ramp easily operated by a single individual. 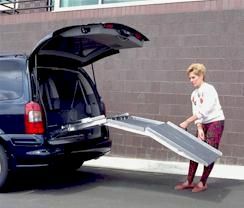 This ramp folds into three sections and stores vertically inside of the van. 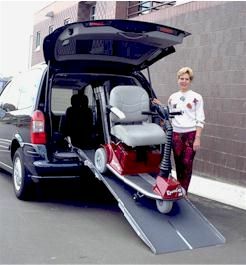 The van ramp is ideal for loading both scooters and manual or electric wheelchairs. The width of the ramp is 27 inches and can be ordered in 7 or 8 foot lengths. 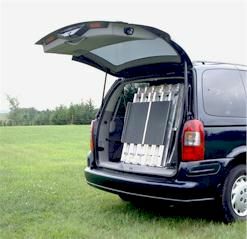 The load capacity is 600 lbs.